Award winning guitarist Maneli Jamal has wowed audiences around the world with his visual style of playing acoustic guitar. He incorporates many musical textures in his performances while keeping rhythm with his two hands but you'll swear he has a trio with him. You've got to visually see him live to experience what you thought is possible with the acoustic guitar. Acoustic guitarist Maneli Jamal has lived in five different countries (Iran, Belarus, Germany, USA, Canada) and moved twenty times by the time he was 18. The young artist gained a sense of musical maturity rarely seen among his peers especially when he transforms his nomadic life experiences into musical movements using extended guitar techniques. There aren't many players in his style that have Jamal's balance of power and sensitivity, nor his breadth of ideas. His rhythmic concepts can be alternately short and dense, or explored carefully through several movements and real life stories. This becomes evident with having won countless music competitions around the world including most recently placing 1st at Canada's Soundclash Music Awards. Having been brought up in a purely artistic and musical family has contributed to shape his unique and comical story telling approach in live settings. He has already performed in 5 continents and 16 countries as a solo performer, has a signature model acoustic guitar named after him and was on the front cover of 2015 Toronto magazine (500,000 copies distributed worldwide). The world is his home and he plays from one end to the other. In this masterclass, you’re going to receive an in-depth look at what makes Maneli's music so special and how to achieve a similar style, with every technique and idea explained in a highly detailed fashion. 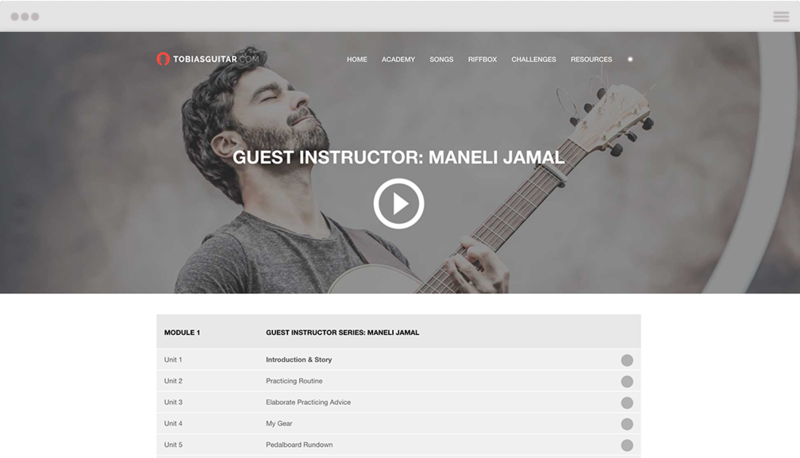 This course is accessible to every playing style, so whether you are brand new to advanced techniques, or a seasoned veteran looking to diversify their style, Maneli's masterclass has something for you. To get you acquainted, Maneli will tell you some things about his background. Stepping right into it, Maneli will show you his optimal practicing routine. Get in-depth advice on how to plan and structure your practice sessions. Learn all about Maneli's gear including guitars, pedals and effects. Take a closer look at Maneli's arrangement of effect-pedals and learn how to set them up the right way! In this first tutorial you'll start to learn how to master Maneli Jamal's piece "Synchrodestiny" as he will explain every technique used in a highly detailed way. Time to find out if you can keep up! Join Maneli in this playalong session for "Synchrodestiny"! Learn more about what make Maneli's arrangements so stunning and take a deeper look at the so called "Persian Modes". In this lesson you'll lay the foundation to mastering various rhythmic picking-patters by starting off with triplets and applying them to different melodic shapes. Even more examples and patterns for practice await you in Part II! Raising the bar in this next lesson, you will learn how to apply 9/8 picking patterns into your play with in-depth tips and tricks from Maneli! 12. 9/8 Fingerpicking In "Vasat"
It's crucially important to also apply newly learned techniques into your play! Therefore, Maneli grants you a deeper look on how he used 9/8 picking in his piece "Vasat". Learn how to incorporate specific percussive effects into your arrangements and play. 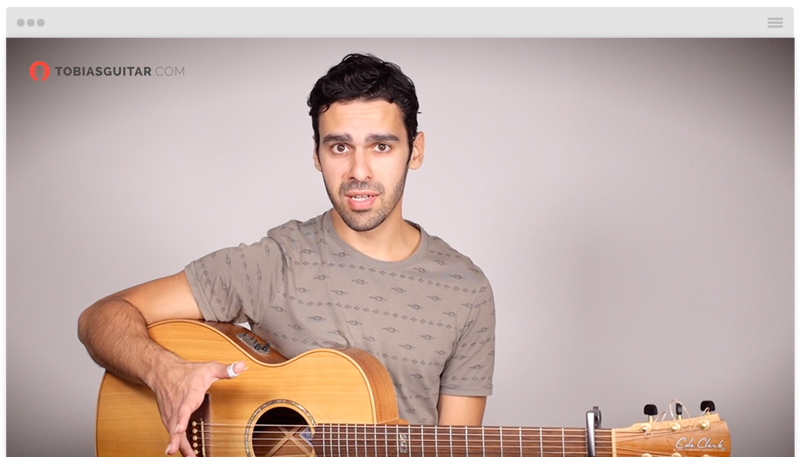 In this lesson, Maneli shares some insight on how to come up with new arrangement ideas and how to build upon them. In this playalong session, you will join Maneli and apply all that you've learned so far into one arrangement. In this first bonus lesson, Maneli answers one of his most frequently asked questions and shares some of his thoughts on how to properly start and expand on writing your own songs and arrangements. 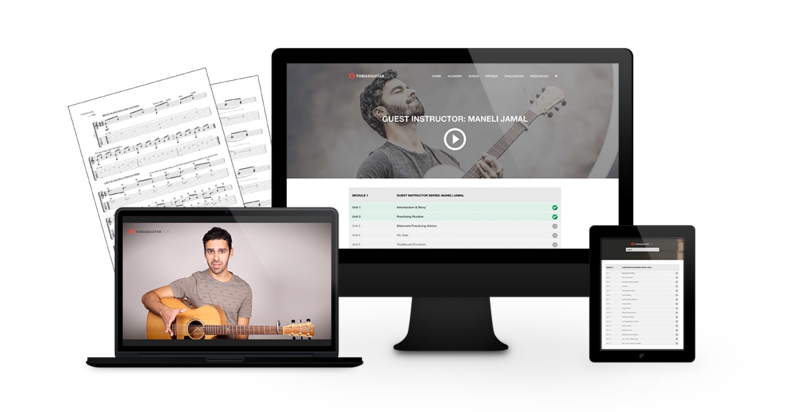 In this last bonus lesson, Maneli shares some of his tips on how to get your musical career started. All tutorials are produced in high quality video and audio to guarantee the best possible learning experience.